When Chef Aklay saw my whole chicken, he said something about using beer...maybe. 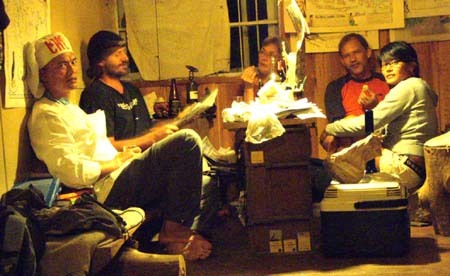 Mabalin is local word for 'maybe'. 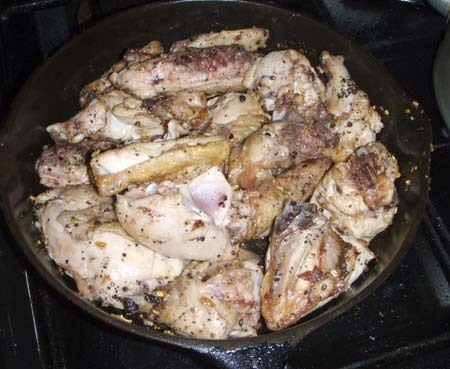 On high heat (Aklay seems to favor lots of high heat to sear the food...the highest the stove will allow), put oil in frying pan, and brown chicken, turning only once. 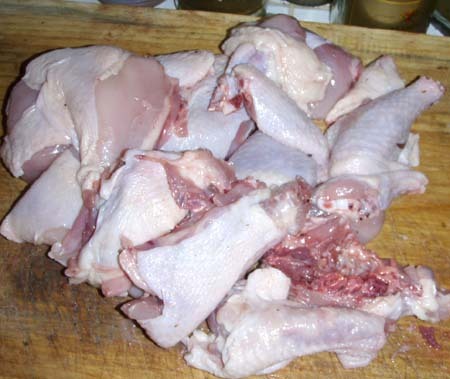 Remove chicken when browned on both sides. 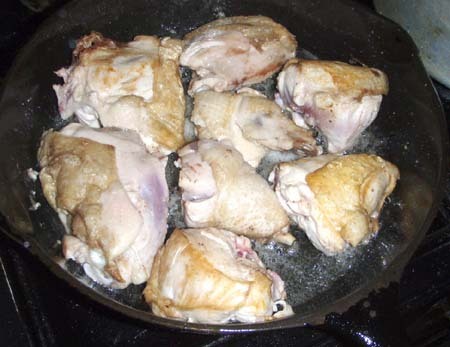 Leave oil on pan. 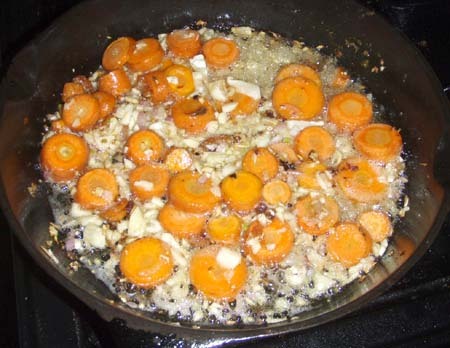 Toss together, garlic, onions, carrots and pepper for about 3 minutes. 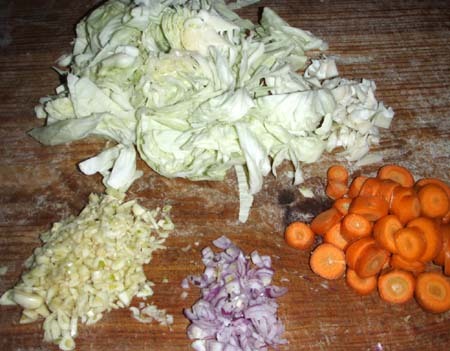 Remove veggies and drain oil. 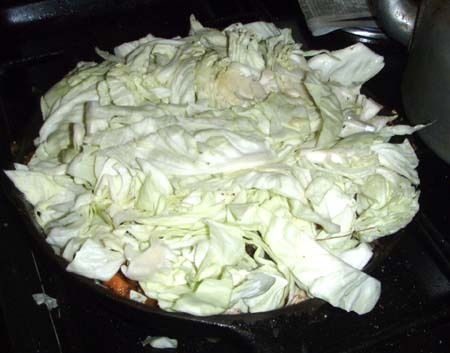 On low heat, layer chicken on the pan (pan has no oil), squeeze to fit in one layer (don't pile up), add fried veggies on top, and lastly, layer the cabbage on top of veggies. Add salt. Cover for 25 minutes. You're done. The taste is comparable to all the chicken dishes we've made before - delicious! I found it interesting to cook everything with the oil drained from the pan. A couple, Clause and Carol, showed up to buy bread from Aklay. They stayed awhile and was invited by Aklay to join us for dinner. As good fortune would have it, they came loaded with a cooler full of goodies - wine, several imported cheeses, paté, calamata olives, Parma ham and even eel! 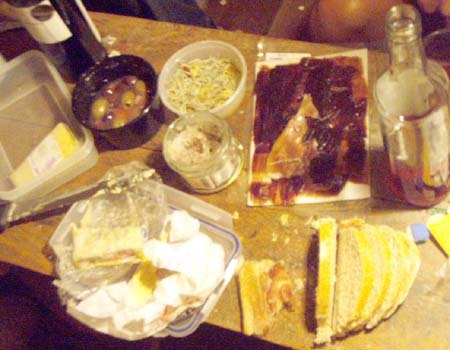 Complemented by Aklay's home-smoked bacon and whole wheat bread and the fresh-off the stove Mabalin Chicken, it was some food party! Oh yeah, at some point in the cooking, I asked Aklay, "Hey Aklay, you said maybe we'll use beer". He replied, "I'm already drinking it." 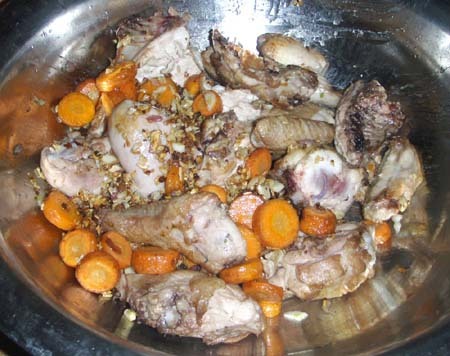 There you go...Mabalin Beer Chicken (Maybe Beer with Chicken).